Persepolis is often held up alongside Maus as a graphic novel of heft. Both tackle memoirs from a tumultuous time period (WWII and the Iranian revolution, respectively) and present history through a personal point of view. I wanted to check out Persepolis to see if it was worth adding to my 6th grade nonfiction shelves. While I'm going to move it to the 8th grade classroom, I enjoyed reading it. Marjane Satrapi writes about her experiences during the revolution, starting when she is six years old, and ending this first volume at age 14 (three more follow). The events of the revolution are always present in Marji's life, even when she is doing simple things like purchasing cassette tapes or trying to hang out with older friends. I appreciated that Satrapi gave the reader a good sense of her personality and what childhood rebellion looked like in an increasingly oppressive society. The illustrations are simple, but they fit. It is powerful to see all the women in the book transition into looking like black triangles because of the garb forced upon them by the government, and later, by each other. Keeping the book in black and white is also effective, as Satrapi uses patterns to draw the reader's attention. 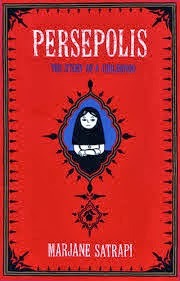 I don't feel very compelled to seek out the rest of the series, but that's more because there are so many other books I want to read...it took me so many years to get to Persepolis. Maybe one day I'll get to Satrapi's life after age fourteen.